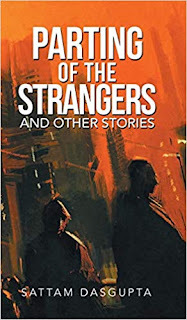 Parting of the Strangers and Other Stories by Sattam Dasgupta is a collection of sixteen well-written short stories. The author attempts to look inside the psyche of human relationships and possibly what inside angels and demons affect them. He tries to bring out the various propositions and consequences that surface up when the slightest change in heart and mind takes place. Invariably, you will find the stories quite real as the author has used first-person narration technique to place the stories with perfect backdrop. 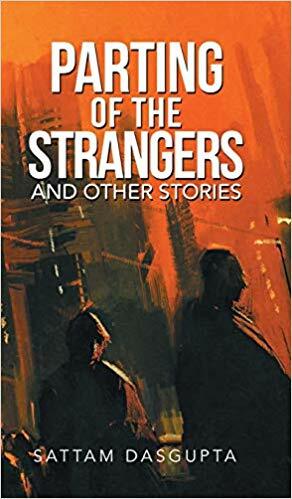 This is my first deliberate foray into reading a collection of short stories based and build majorly around human relationship psyche,and for me it comes as a compelling read. I just know one thing that after seeing the cover page and reading a couple of stories you will not be able to stop yourself until you finished the book in one sitting. It just happened with me. In first three stories, Sattam has focused on 'parting and separation'. When the characters with sudden realisation and bursting of emotions, move on for different routes, it is done with illumination. To my opinion, the collection is divided into single stories and connected stories. For connected stories there are two sets, in first we have Rahul - how his life changes from to be salt-of-the-earth couple to time-tested brother for his sister Ria. In second set, we see machinations of corporate world, Dev suffers worst may be he was expecting people nice and rational in his office. Was it humility and respect for his mentors that forced him into cold and deep waters? With thematic importance for strong human relations and their allied complexities, I gathered mixed feelings for this book and felt assured that no matter what the time or situation is, convulsion of human aspirations is inevitable. And descriptions of urban cities like Bangalore and Kolkata occur regularly in most of the stories. In fact, the urban culture and way of life is presented as a nudge that helps us in understanding characters and their desires, at the center of narrative. Sattam does not shy away from presenting the instability of the characters that arise owing to the change in their behaviour and attitude. With an aura of surprise and suspense and the meticulous depictions of urban Indian life mixed with amazing level of linguistic skill that often enters the poetic realm, it will leave you with a sense of cathartic experience. Overall, it makes for a delightful read with near-to-perfect writing style of Sattam.